We made it! 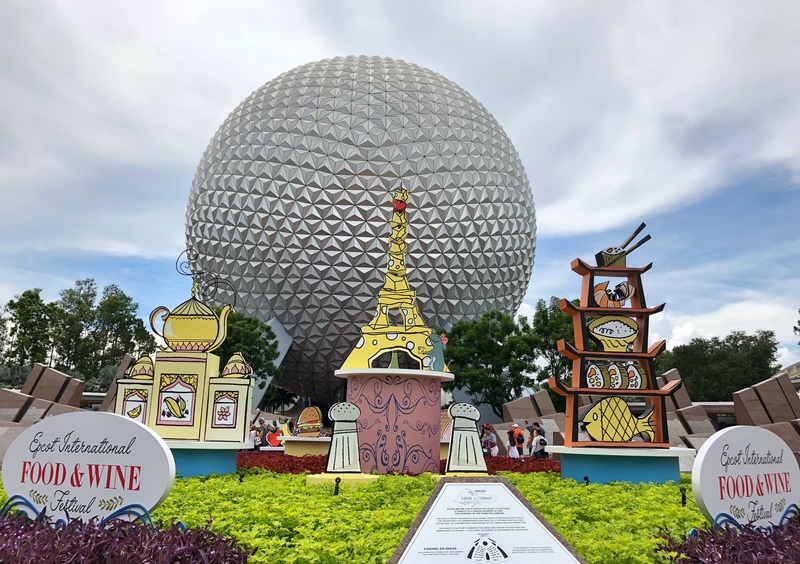 The 2018 Epcot International Food & Wine Festival has finally arrived, and with it, as always, we get the chance to sample dozens of new tastes from around the world. I visited the festival on opening day to sample all of the new food items that this year’s festival has to offer, so you know exactly which new items are tricks vs. treats (hey, it’s almost fall, right?). 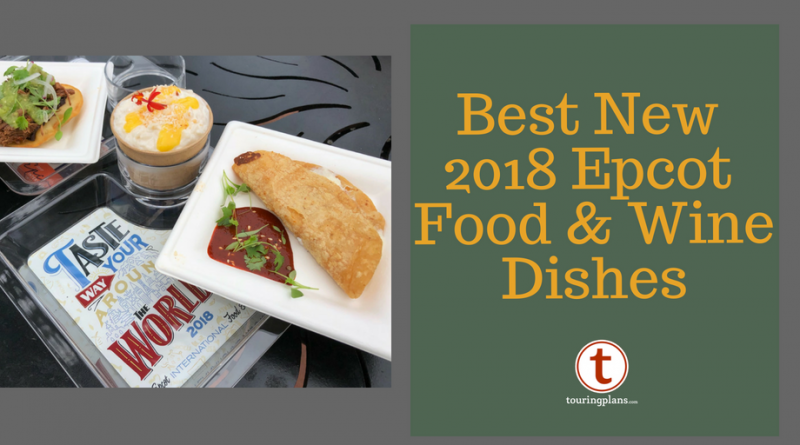 Below, you’ll find reviews and photos of all of the new food, and at the bottom of this review, you’ll find rankings of how I’d categorize each dish (skip, try, or must-try). Be sure to click each photo for a larger view of every dish. Replacing the odd but popular avocado mousse dessert from last year, these energy bar bites sure aren’t visually appealing, but were actually a fascinating taste treat. They were most similar to brownies in texture and flavor, but you can definitely tell they’ve been “healthy-fied” with the sweetness of the dates and dried fruit coming through. 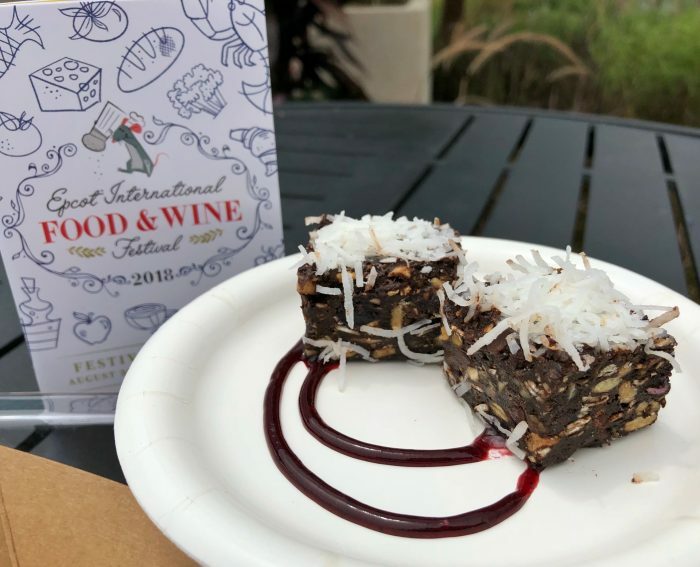 I wouldn’t rush back to these, as there are far better desserts around the festival, but they are a fun way to trick kids into eating something slightly more nutritional than a candy bar. 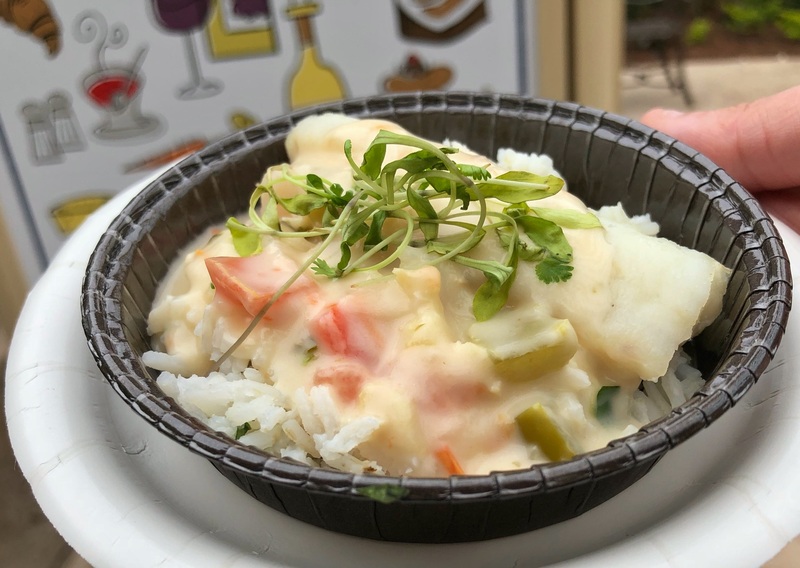 I was a little sad to see my favorite dish from Almond Orchard last year disappear in favor of this scaled down version this year, but have no fear – it’s actually much tastier than it looks. 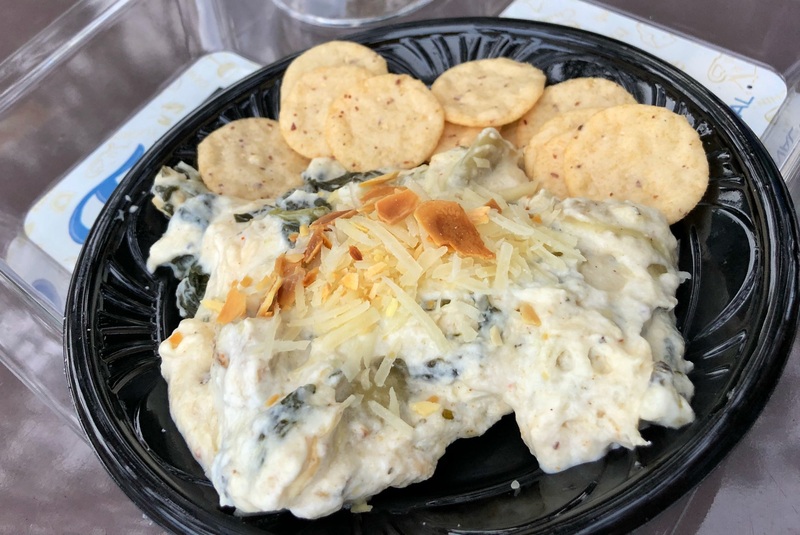 This is your basic spinach artichoke dip, creamy and full of herby, zesty flavor, with the addition of pulled chicken in the dip. The almonds are, frankly, an afterthought here (though I imagine the dip is made with almond milk, you can’t tell), but that’s ok – it’s flavorful and filling on its own. This is a solid pick as a snack in the cooler weather towards the end of the festival. I have to be honest, this doesn’t look super appealing and didn’t taste all that great. I tried several bites, trying to get any coconut or lime from the sauce, to no avail. The white fish was bland and a little tough, while the shrimp and scallops were a tad fishy. For such a colorful booth usually packed with flavorful dishes, this was a miss, for me. Run, don’t walk, to try this. I am not a big maple person (maple-flavored desserts tend to be way too sweet for me), but this had the perfect balance of savory creaminess from the cheesecake base and caramel/maple/pecan flavors from the toppings. This is fall on a plate, which may not be as convincing to your brain that it’s fall in August as it is in October, but it’s definitely worth a shot. I will be grabbing one of these every time I visit the festival, it was that delicious. A dark horse for one of the more interesting and fun dishes I sampled, this crepe pancake stuffed with spicy braised beef grew on me with every bite. China’s booth sometimes skimps on originality, but I really liked this dish the more I tried it. 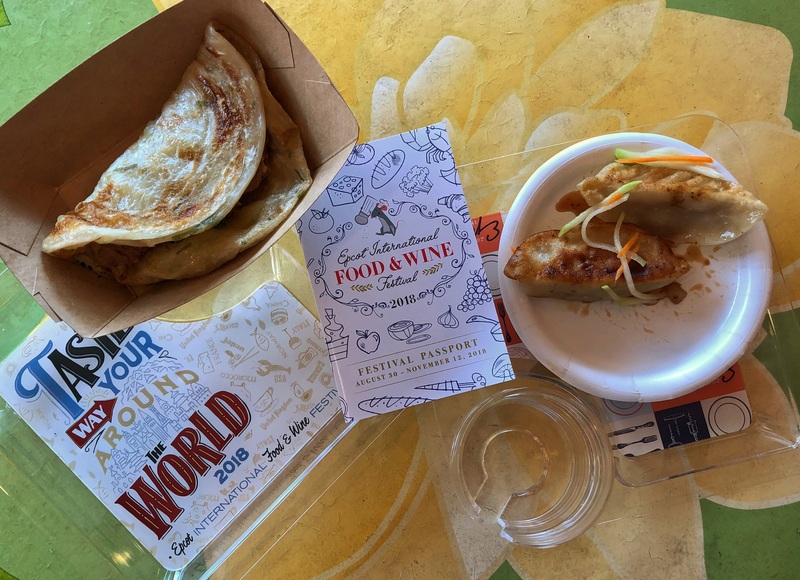 The crepe pancake is packed with scallion flavor, and the beef inside had a ton of spice and savory sweet notes to it – there was a lot going on and I was very into it. 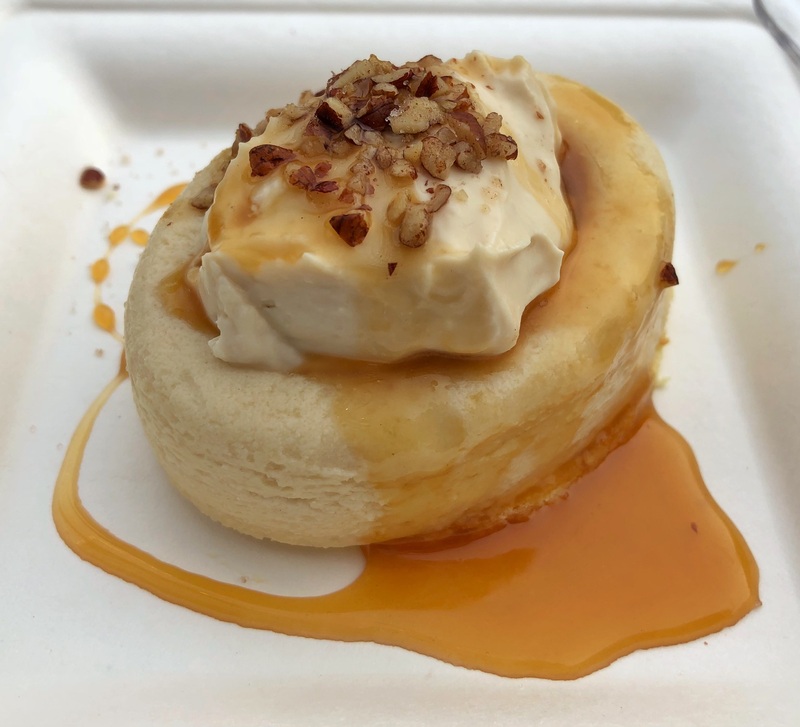 This dish is one that is best enjoyed fresh – if the pancake sits out too long, it can take on a tough texture, so wrap it like a burrito and enjoy as you are walking to your next booth. I can’t wait to try this dish again on my next festival visit. Two rather plain dumplings and a whisper of crunchy slaw – this plate was a little sad, even though it was still totally edible and enjoyable. China booth has tried dumplings in the past, and they’re usually just fine – this is no exception. The chicken filling is simple and inoffensive, and kids will find the mild flavors of these dumplings palatable. But different, these are not; skip if you want to save money and stomach space for more adventurous items. I know what you’re thinking – there’s no way a vegetarian burger could be better than the real thing. If you haven’t tried an Impossible Burger yet, I could definitely understand it. But this burger has the same look and feel as real meat – it’s uncanny how “real” it is. The texture of a cooked burger is a lot like a well-done beef burger – not dry, but not overly juicy either. 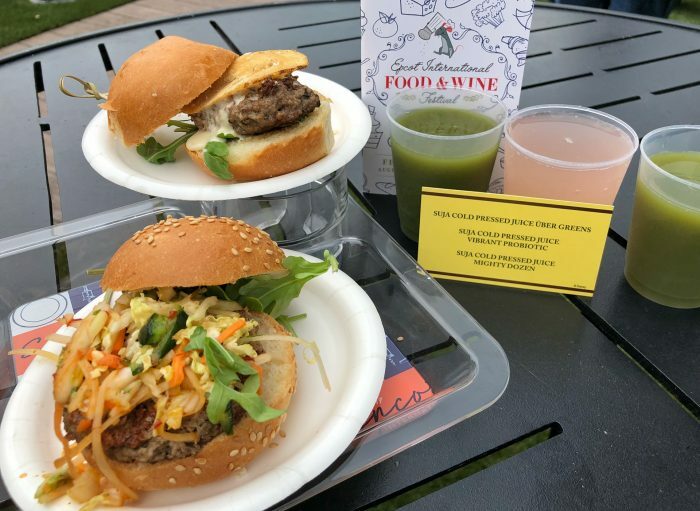 The crunchy, zesty slaw on top of this burger really complemented the savory “meat” flavor, and made it stand out with fresh flavor compared to the beef slider. Definitely a surprise favorite for me, I was still thinking about this dish after nearly 8 hours of tasting – a high compliment. Originally, Earth Eats was supposed to feature a Kombucha flight, which I was kind of excited about given how trendy it was. Unfortunately, it seems something changed before opening day, and this swapped to a flight of Suja cold-pressed juices. Available in your local grocery store, I wouldn’t spend the money on this flight or individual flavors unless you’re absolutely craving something fresh. The Uber Greens flavor was downright atrocious, and the Vibrant flavor had… well, no flavor. But the Mighty Dozen mix was bright with tons of ginger and herb flavors over top of lots of fruity notes – I was a fan of this, and finished it alongside my veggie burger. 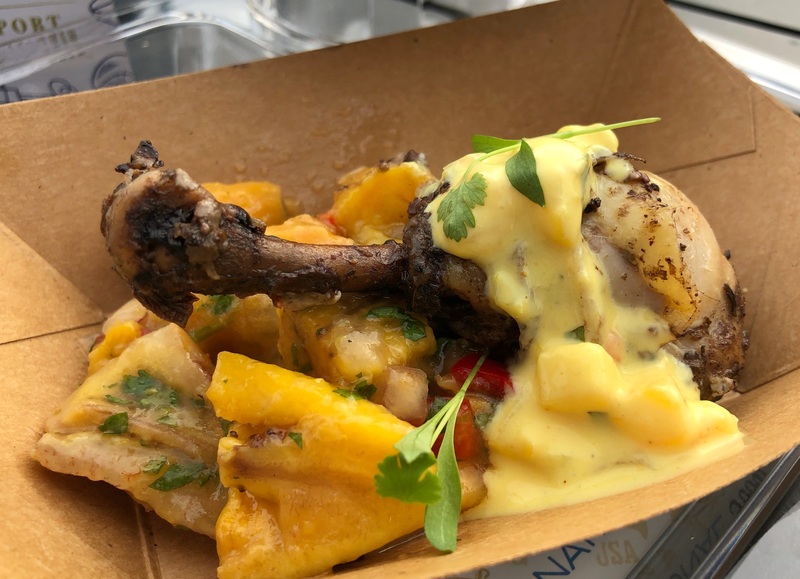 If you can stand the smoke from the grills at this booth, this dish might be worth a visit (if you aren’t already enamored with the fan-favorite piggy wings). 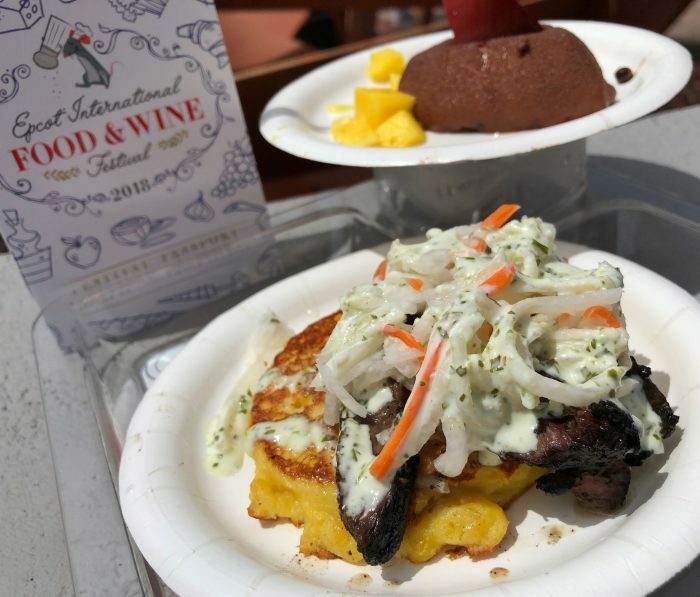 It’s a pretty simple dish – charred steak (with a hint of herb flavor; sadly the chimichurri is an afterthought) sits atop a really tasty smoked corn cake (think: pan-fried cornbread but creamier inside) and topped with a pretty standard creamy slaw. The steak on my portion was a tad on the tough side, requiring a lot of chewing effort for minimal reward. But the corn cake underneath was great, and the slaw was cool and refreshing, enough to make this a mild success and a dish I’d recommend if you’re a steak lover. I wouldn’t run towards this dish, but simpler eaters who like spice may find this a good option. The pot roast on this plate was a tad on the tough side, dried and in desperate need of some jus. However, the horseradish cream and pickled veggies blew my face off with spice, a nice surprise in a normally tame booth. My dining companion, however, never tasted the spice – it seemed to be inconsistent from bite to bite. The potato roll and crispy fried onions are as simple as they sound, not really lending much to this dish. Overall, this is a “proceed with caution” plate – it’s simple and could be good, but also could be a waste of money depending on how dry the pot roast is. There’s always one – a dish that, by the time I arrive at the booth after eight hours of sampling, they’re just plain out of. I was a little bummed not to get to try this, as I’d heard raves from others earlier in the day, but sadly, it’ll have to wait til next visit. I really wanted to like this dish; sadly, I really didn’t like this. The chicken lollipop I got was, by luck, pretty poorly seasoned, with most of the jerk spice rubbed off, leaving only fatty, unrendered chicken skin and bland meat. The sweet plantain salad is served cold, which to me was a bit off-putting, even though I loved the splash of acidity from the salad’s dressing and the mango chutney yogurt. Hopefully this dish is better on a second go-around, but I’m not rushing back to try it. Do you like chicken? Do you *only* like chicken? Then this might be a good choice for you! This braised chicken thigh was tender and juicy, served in a basic tomato sauce with a small portion of parmesan polenta (easily ignored if you are picky and don’t love the texture). Picky eaters and kids might find this up their alley if they can deal with the mushrooms. Personally, I found it “fine” – it’s serviceable chicken, well-cooked and filling. “Fine” is probably also the best descriptor for this dish – it’s a very, very simple pasta marinara with a few bits of pancetta and some parmesan cheese on top. The pasta was al dente, the sauce was clinging to the pasta well, and it had a nice, bright tomato flavor. Is it worth the price? Absolutely not. 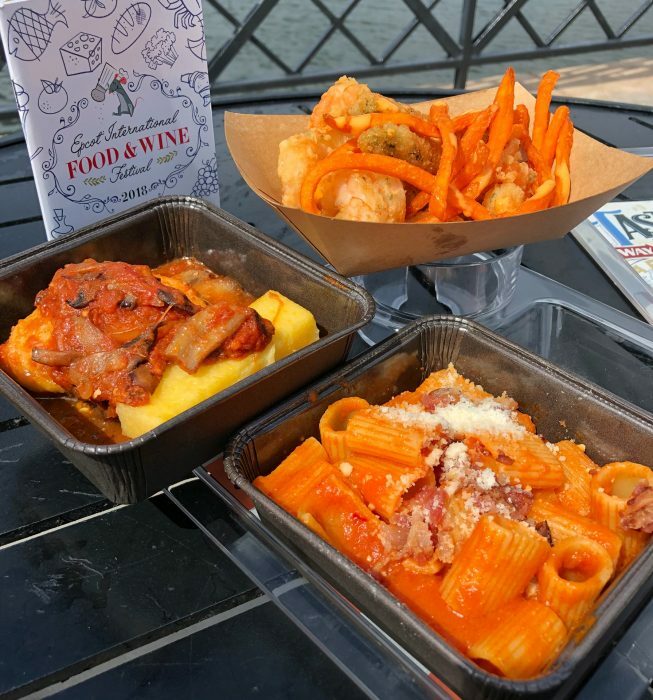 But if you have a kid who has been whining over scary dishes at every booth in the back of World Showcase, this is your stop – it’ll placate the masses while you enjoy the fritto misto or Spain’s charcuterie in a cone. I’m always excited to try Japan’s new dishes – they’re usually kind of off-the-wall and rarely successful, but it’s always and interesting experience. This was no exception – The beef on here is literally a slice of medium-cooked steak, dabbled with a bit of shrimp sauce and sitting atop standard sushi rice, with a few tiny diced jalapenos on top. It’s not great if you’re a sushi lover – the beef is texturally very strange in comparison to fish, and doesn’t really offer a ton of flavor given how thinly it’s sliced. Much more reasonable for sushi lovers, this hand roll is huge and packed with flavor. The tuna and salmon mix is very finely diced, with tons of spicy sauce mixed in and on top. I’d venture to say this is about the size of a normal sushi roll at Katsura Grill, and of similar quality, so definitely give this a shot if you’re looking for something more traditional. Another surprise favorite, this teriyaki bun is larger than expected and packed full of chicken and veggies. The teriyaki sauce definitely tends towards the sweet side, so it may be a skip if that’s going to be an issue, but the fluffy bun and savory filling were really satiating in the middle of the afternoon. I’ll definitely be back to grab one of these as a snack while wandering the park. If you’re into souvenir plasticware, this is the must-do of the festival for you. Delivered in a Light Lab-branded plastic beaker, and served alongside a tasting card with “magnifying glass”, this drink is a cute attempt at edutainment for kids and kids-at-heart that really does succeed in making kids briefly excited about science. There’s a lot of moving parts to this drink (thee two accessories plus the glass, plus three flavors of frozen drink layered inside), so expect lines for this drink to be astronomically long. I waited upwards of 15 minutes very early on day one of the festival after ordering this drink just to receive it -–and while it’s very cute, it’s again just a sweet concoction with little actual flavor. Green apple-y mango mélange is really what I’d call the taste here, but your mileage may very dependent on how they layer and mix the freeze in your flask. This dish is simple in description and simple in execution – it does no more or less than what it promises. This is a small cheese quesadilla with a few popcorn sized shrimp inside; no other flavorings inside or on top. The guajillo chili sauce served for dipping is the real revelation here – tons of smoky spice, a bit of nuttiness from the sesame seeds, and a real boost of flavor. I’d leave the quesadilla, but I’d eat that sauce on nearly anything. Tostadas don’t seem like the wisest choice to serve outdoors in humid Florida, but surprisingly the crunchiness of the corn tortilla held up without becoming too chewy here. The short ribs were incredibly moist and spicy, with the black beans and salsa underneath really just serving as a backdrop to their flavor. I could see myself potentially coming back for another one of these before the festival ends. Mexico usually nails their desserts at the festivals, and this is no exception. It’s again, very simple – rice pudding with a coconut note running through it, and a bit of mango sauce on top. For all its simplicity, though, this was well-executed and super tasty. I didn’t find it too sweet, since the light freshness from the mango helped take it out of the “cloying” realm, and the rice inside had a nice bite to it, rather than just being pure mush. I’ll definitely be back to try this again on a future festival visit. 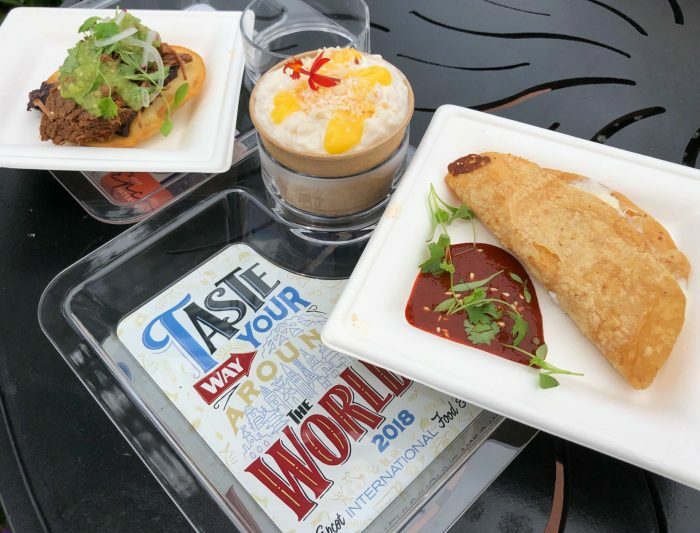 A note here – the menu at this Festival Center “booth” features a ton of breakfast-y pastry options. 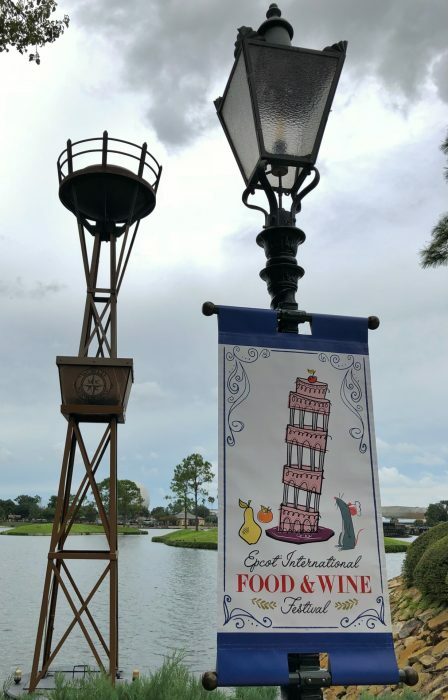 If you’ve ever stopped at a Joffrey’s booth before park opening or early in the morning, these are exactly the same pastries as you’d find there. Therefore, I didn’t feel the need to review them for you – you know what you’re getting into here. Besides, the real draw here is the mimosa selection. I tried four of the five flavors, and here are my thoughts on those. 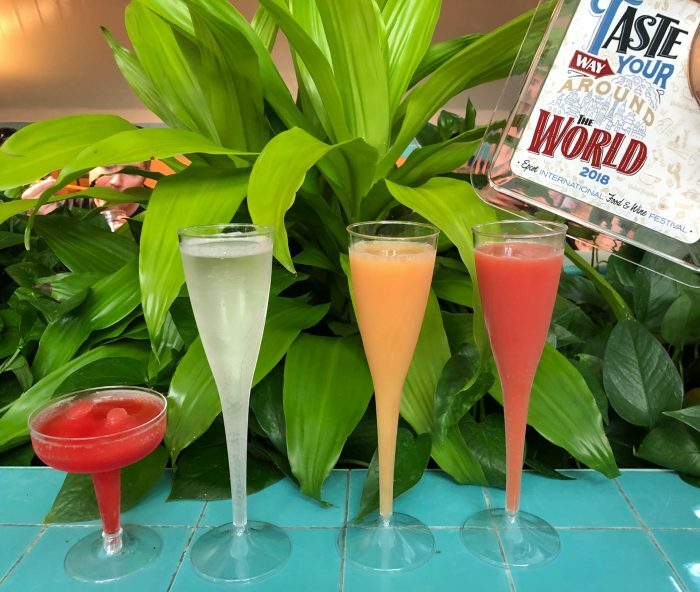 These are both pretty standard juice-forward mimosas – tropical flavors abound, and the sparkling wine in both of these tends to be less pronounced. Stick to the Blood Orange if you’re looking for a traditional flavor, and the Madras if you want something a little lighter. This one is a little strange – I prefer it to the key lime sparkling wine that is typically commonly served during festival season, as this is way lime-ier in flavor. There is kind of a strange aftertaste here, almost vanilla-like in scent or flavor, and I never quite tasted the white cranberry juice that’s in here (though it’s clear it’s not just sparkling wine). Proceed with caution, unless you’re adventurous. Run, don’t walk, to grab one of these – it’s sure to be a massive hit for the festival, and for good reason. If you’re a fan of Shirley Temples, this is essentially one of those, frozen, with alcohol. The fruit flavor here is kind of tough to discern: it could be cranberry, could be cherry, even a hint of citrus. But it’s really just there to offset the lime hard seltzer and provide some color. It’s tasty, everyone will want one, and I’d bet this will stick around for next year’s festival, too. Here’s another highly successful dish that screams fall on a plate. I really loved this ravioli – the brown butter vinaigrette on top provided a lovely nutty and sweet note to complement the sweet squash filling, with very savory toasted pumpkin seeds giving some much-needed texture and crunch. 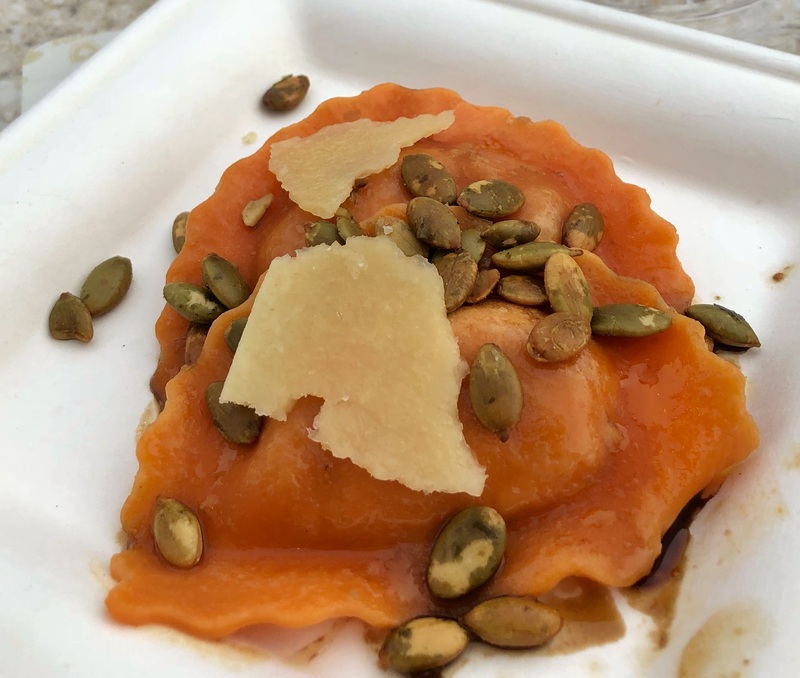 Each plate comes with two ravioli, and I would’ve gladly eaten ten plates had this not been my last stop for sampling day. 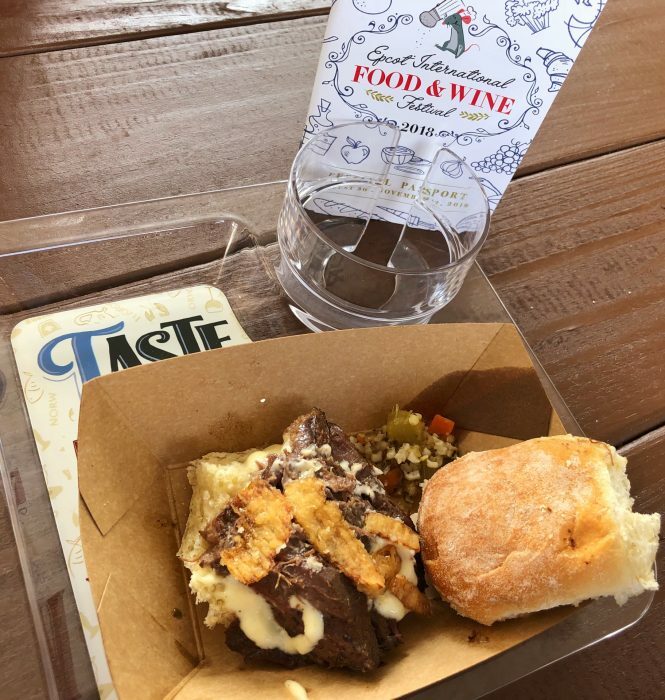 Here’s how I would group the new dishes I sampled – obviously your mileage may vary, but with limited time and money for festival visits, you’ve got to prioritize it all! There you have it – my rankings for this year’s new dishes at the Epcot International Food and Wine Festival. 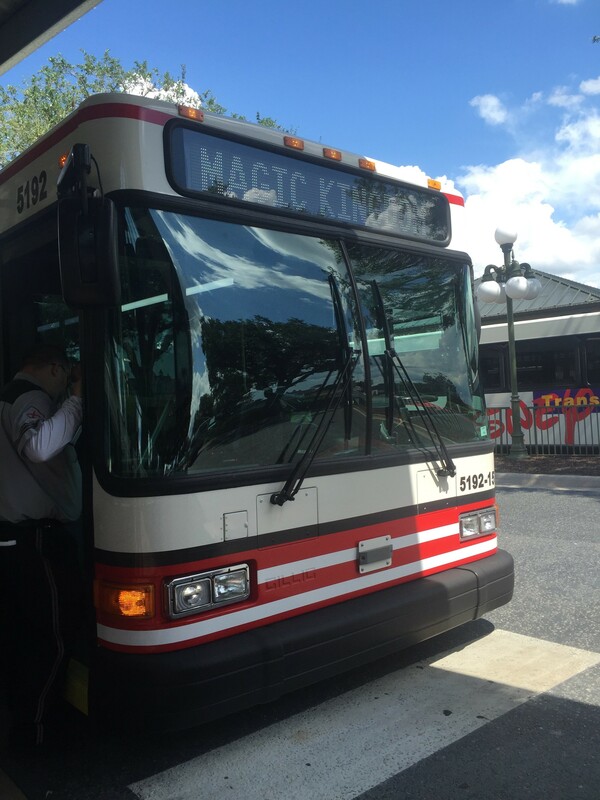 I’ll be back soon with a look at how some of our returning favorites are doing this year. 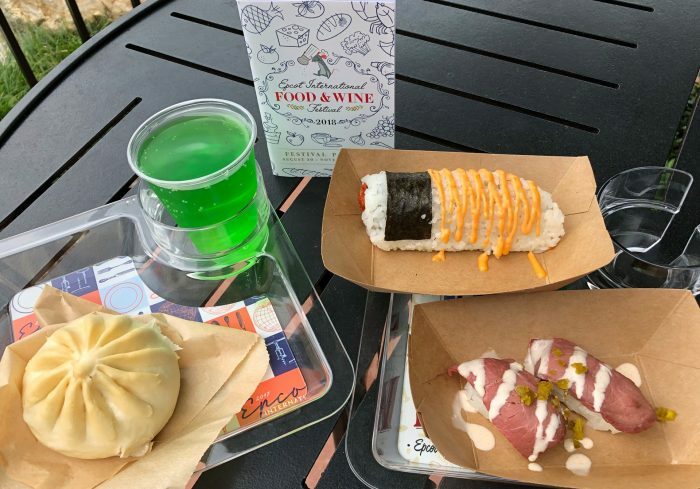 Let me know in the comments which of these new dishes or returning favorites you’re looking forward to try this year! 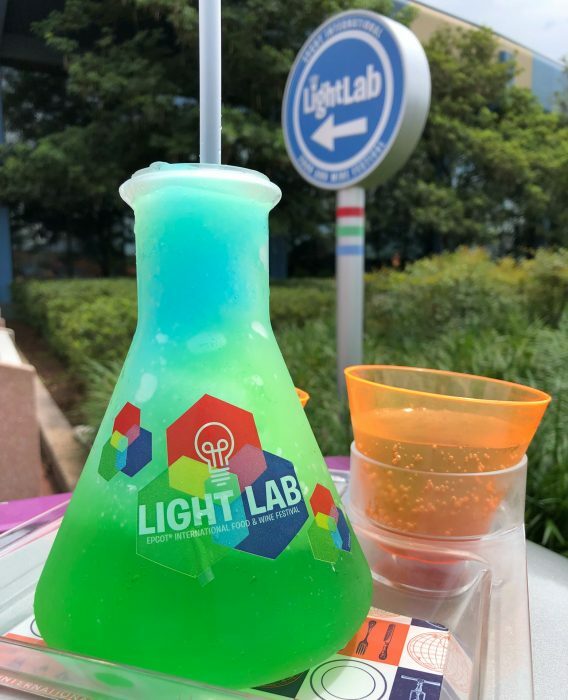 The Light Lab vessel is not a beaker (beakers have wide mouths and straight sides); it’s an Erlenmeyer flask. If the Fromosa is really driving for Shirley Temple flavors, it’s probably pomegranate – that’s the original flavor in the grenadine syrup typical of the Shirley Temple (though many American brands, if they don’t use artificial flavors, use blackcurrant instead). I was thinking the same thing about the flask, but I didn’t want to be that person. Glad you did it for me:) Nerds unite! Excellent review of the food! I can’t wait to get there and try everything in late October. Hopefully they’ll have worked through the inconsistency issues between servings! Your review is making me wish we could go again. We loved it last year. Oh well, maybe another year. Thanks for taking one for the team and trying all of the food.